When you're designing an application, there is a temptation to build it to a super-scalable future-proof architecture, even when the immediate requirements can be met by a simple single-tier application that can exploit the pure power of IIS and SQL Server. Dino recounts the painful story of what happened when the gurus got their way. Anyone reading this true tale of a (software) horror story, who is of a nervous disposition, can be reassured that it has a happy ending, but it has a moral too. It’s a sadly common story of legacy code, performance bottlenecks, (very) long-time caching, localization and hot CPUs busy at over 90% for no apparent reason. The plot involves a team of gurus who evolved a working system with the declared goal of making it super-scalable. At some point our hero was called in to fix the legacy code, and while he was struggling with it a bunch of HTTP 503 messages appeared in the log, and it started taking longer to open the home page of the site than going through the queue in the cafeteria at peak time. Our hero made his own mistakes as well, but learned-or just refreshed-a lot of things about what it means to build ASP.NET web sites for the real world. In the end, I think that there was one core reason for the hassle: Paraphrasing Don Knuth, I dare say that, yes; premature scalability is another root of most of the software evil we face these days. Once upon a time, there was a web application created in the classic four layers of DDD (Domain-Driven Design) – presentation, application, domain and infrastructure. The system was all in a single tier, quite compact and efficient. It didn’t have to support the typical million users that most architects and customers aim at. It was a humble system that was not expected to exceed the peak of a few hundred users simultaneously connected. When it first went to production, the system was right, just right, for the job; and, more importantly, it never gave signs of inadequacy. The ASP.NET process at the gate was briskly receiving and dispatching requests. Each request made it quickly to the SQL Server instance where an active list of threads was rapidly processing queries and updates and return data promptly. What If We Make It More Scalable? The other Gurus nodded wisely. It all sounded very plausible. A Web API layer was created to hide any SQL Server details to the application layer of the frontend web site. The system went to production and it was immediately clear that the performance was not the same. The figure below attempts to explain how the problem was then tracked down. 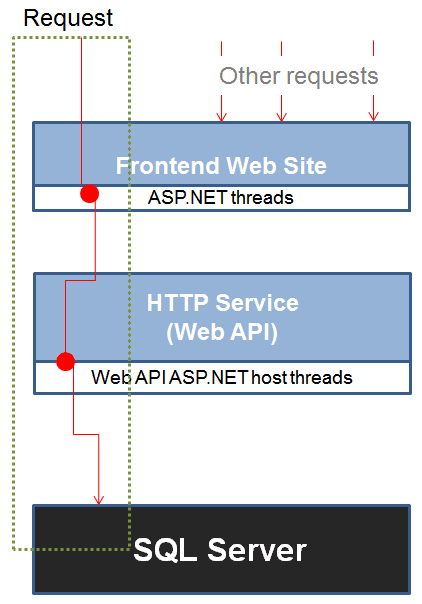 ASP.NET assigns each incoming request to a thread from its own pool and the thread remains engaged until the response is generated for the request. This means that one less thread is available to serve other concurrent requests. This is unavoidable if the thread is actually busy doing some CPU work. However, you’ll see from the figure that the ASP.NET thread was just waiting for the HTTP service and the SQL Server instance to do their work. With the architecture depicted in the figure, the cost of data serialization had become significant. In a single tier, all data is moved within the same process space and no serialization really occurs, except for the super-optimized, and inalienable, data transfer in and out of the SQL Server process. Transportation costs increase when a service is placed behind a HTTP faÃ§ade. In the first place, there is the cost of the HTTP call. Secondly, you have the cost of serializing input data from HTTP chunks to usable values to arrange queries or updates. Finally, there is the cost of serializing any SQL Server response to some text format, most commonly, JSON, that can be sent across the wire. After an overnight technical meeting, the team of Gurus determined that the quickest fix to apply was to introduce some intermediate cache in the HTTP service to reduce the response time. “Having some cache right under the surface of the HTTP layer of services” the gurus said, “is helpful because it reduces the load on SQL Server while enabling admins to vary the cache duration according to detected traffic”. As it happened, having the cache helped; and it improved the average response time enough for the system to go live. Sadly, this sort of fix could only postpone the inevitable problem. At some point, the number of users visiting the site started increasing and other clients, mostly mobile applications, were built to consume the same HTTP faÃ§ade. As a result, the number of requests concurrently knocking at the door of the HTTP service grew significantly enough to compromise response time again. This time, though, there was no chance of further increasing the cache. This would have frustrated the primary purpose of the site and offered uselessly-stale data to users. Our hero, who inherited the legacy code to fix it, had to work out a plan and implement some working artifacts quite quickly. The first thing he tried was adding an output-cache layer. The method decorated with this attribute caches its response for a minute and a copy of the output is saved for any value of the ID parameter being passed. This means that ASP.NET creates distinct entries in the cache for the output of /details/1 and /details/2 and any other value of any other method parameters. The output cache is stored in the ASP.NET cache with a time-based dependency. When the time expires, the entry is silently removed from the cache. In this way, the next request that comes for the same URL can’t be served from the cache and goes through the regular request lifecycle. The output is cached again and the process repeats. The benefits of output caching are obvious, and take effect immediately. Unfortunately for our hero, the system also had a couple of features that made output caching a bit harder to implement. One was the multi-tenant nature of the site and the other was the localization of large chunks of the content. What about localized versions instead? If the current language ID is carried via the URL then it would fall in the realm of the custom string setting. Otherwise the VaryByHeader attribute is an option to evaluate. VaryByHeader lets you use a specified header name to distinguish copies of cached content. Which header, though? At first, it may seem that ‘accept-language‘ is the perfect choice. Unfortunately, its effectiveness depends on the logic that the site actually uses to switch language. The ‘accept-language‘ header indicates the language of the browser which is just one way for a multi-lingual site to switch content. If the site relies on explicit user’s preference or geographical detection then the ‘accept-language‘ header approach wouldn’t work. The application in question, though, used cookies; therefore the right header to use was Cookie. It’s interesting to notice that the effectiveness of output caching also depends on the location where cached content is stored. By default, ASP.NET caches the output anywhere possible. This means that most content stays cached on the browser and never hits the server. This fact forces us to use VaryByHeader to cache by language. As an alternative, you can set Location equals to Server and generate a language specific key in GetVaryByCustomString. The performance relief for a decent response time that came from output caching was short-lived. As the number of simultaneous users increased again, the site became almost entirely unresponsive because too many requests were held in a queue. The service was just too slow to match the pace of incoming requests. When HTTP 503 error pages started to appear, it became obvious that the story about the long queue was not simply a joke. In IIS, a web site is usually allowed to have a queue of pending requests no longer than 1000 requests. It’s crucial to note that a request here means a plain request from a browser-for a CSS file, an image, an Ajax call, a full HTML page. Each browser can have a few (typically, six) concurrent sockets opened and a canonical page of a modern site usually requires more than six requests to complete. Furthermore, most page requests were hitting the HTTP faÃ§ade which, even with the cache turned on, at some point became not so quick to respond. It was clearly a design issue, but what could our hero do to fix the site right away? In general, the first option to consider to improve performance is reduce pressure on the site adding caching layers. However, there was already a cache in the HTTP service and that was not enough. Also, there was already a cache at the IIS gate (the ASP.NET output cache) and it was also not enough because the nature of the site didn’t allow for too long caching as requests were coming along too quickly. Another option is to rewrite bits and pieces of the controller layer in an asynchronous way. In a multi-tier schema, such as in figure above, where should you intervene first to add asynchrony? Should it be the frontend web site or the Web API layer? Both layers would gain from async controllers. Here’s a possible way to quickly rewrite any controller so that it leverages asynchronous capabilities in ASP.NET MVC. In addition, yet another caching layer of a few seconds was added on the frontend so that a smaller number of requests were actually hitting the HTTP layer. A more ambitious and deeper rewrite would probably turn the middle tier into an async layer. However, these little changes quickly fixed the dramatic performance issues of the website. At least for the range of users that commonly visit the site, performance was again just right: As right as it was before an incautious attempt to scale the site was made. The net effect is that performance was fixed; but the site is not scalable at all. A system that was originally fine-tuned, compact, simple and efficient was inadvertently turned into a ‘finely-tuned’ system as slow and cumbersome as a tuna in the net, and as lively as tinned tuna. Beyond all the incautious design choices, and the additional mistakes made along the way, I think there’s a noticeable moral in this software horror story. These days, scalability is better achieved with a super-optimized and compact single tier web application that is then deployed to some cloud infrastructure. When, and if, it faces high traffic levels, it can then be promptly fine-tuned to cope with the traffic levels it faces. Manually created tiers are still an option, sometimes an undeniably reasonable option, but manual tiers require a lot of care and careful multi-threading and caching instructions. And if you fail at that, well, you’ll have a (software) disaster on your hands. PS: A similar project created later facing the same traffic works beautifully in production. It’s single tier and makes plain direct calls to SQL Server with only a little bit of output cache. No data caching, no HTTP intermediary; just the pure power of IIS and SQL Server. OK, it’s not like, say, Facebook, but the customer on the other hand didn’t ask to build a social network scale system! While I agree with the general gist of this article – that scale-out designs can negatively affect scale-up capabilities – there are a few worrying misconceptions about async. "This was hardly a decisive help, but would give users the perception of a more responsive site. It is one thing to be frustratingly looking at the hourglass; quite another to looking at the hourglass, feeling angry but slowly receiving content." Async doesn’t begin responding to the user any sooner than a synchronous handler. In ASP.NET, "await" yields to the thread pool, not the browser. "Here’s a possible way to quickly rewrite any controller so that it leverages asynchronous capabilities in ASP.NET MVC." No, no, and no!!! Task.Factory.StartNew will *negatively* impact response time! Unfortunately, this was introduced along with "yet another caching layer", or the hero would have noticed that this change actually *hurt* the performance. Stephen Cleary raises some very valid points about the threading model, unsurprisingly too, Stephen literally wrote the book on Concurrency in C#. In regards to what the original architect intended, he clearly wanted to move to a SOA system. He unfortunately made the very wrong choice of taking the resource access layer and turning it into a HTTP service. The resource access layer in a system in almost every conceivable scenario should be synchronous in process communication using memory transport. I fully support it being SOA and it using serialization between the layers but it needs to use an in memory transport, specifically one that is specifically not queued. If the architect had made this decision to use in memory transport, this would mean he would have to accept HTTP connections somewhere else. That there would be a proxy between the resource access service and user request. You can now host slim verticals as many times as you want. Localization+output caching is an issue? Well make sure Japan gets its own copy of the app. Japan should have its own copy of the application any way given how far away it is from other nations, i digress. With the Japan isolated copy it would have output cached the correctly localized content. If JP users could use english too, stand up another web server. Web servers are absurdly cheap and should be stood up and shot in the head on a whim. When scale becomes the real goal moving to a truly asynchronous system. Asynchronous meaning decoupling the time line from the application, not tacking on async. The only way to achieve this is using a Message Bus / Queues to decouple the application and make it fully adopt eventual consistency. Reality is eventually consistent. Rigid consistency systems are an aberration from reality and are head in sand ignorance of reality. A business doesn’t stop taking orders when they warehouse is down or the billing system is down, they pull out paper and take the orders on paper. If your application can’t do the same it’s really 3 steps forward 8 steps backwards. Of course this is why many business people view IT expenditure, the ones that have grown through the tech era have seen all kinds of insanity that a business is crippled by a website going down when that problem never existed when things were done by sales people first hand. — Reality is eventually consistent. Rigid consistency systems are an aberration from reality and are head in sand ignorance of reality. I’ve been denying this many places since the Russian Bank Hack made it clear that the hackers were able to do that voodoo that they do specifically because banks are "eventually consistent" every 10 hours, or so. You can look it up. "Eventual consistency" is proxy for "steal all my resources". Server repositories behind a HTTP facade? The moment I read the bit ‘putting the SQL Server repositories behind a HTTP facade would be beneficial to us’ I had flashbacks. I witnessed a very similar decision: Fortunately, we were able to perform a rapid U-turn which fixed the problem. No plastering over the cracks with caching or Async thank goodness. In Dino’s sorry tale, I feel almost certain that this poor design decision was the sole cause of the problem. This type of interface is extraordinarily difficult to do. For effective scaling, you have to start with an effective message queue with good diagnostics that can’t lose a message. What I got from this story was that a team had a general idea to make their site "scalable" without defining what that actually would look like. Then they made open-mouth mistakes continually along that journey. The author doesn’t appear to understand how asynchronous ASP.NET works (even Stephen Cleary’s popped a note above). Such that by the end the author throws the baby out with the bathwater and says the whole architecture was wrong and the most "scalable" design is actually the least "scalable". I see this all the time in contracts where you suggest an idea and they say "Yeah we tried that and it was dreadful. Are you sure you’ve experience doing this?" When what they mean is, "We naively ballsed-up doing that and now blame the idea itself and anyone that suggests it." Before scaling up, out, onto the cloud: 1) make sure your team has time and budget to read lots of books 2) fix your code 3) forget the word scalable and use empirical goals/tests 4) don’t mistake request speed for throughput. My advice to any ‘guru’ is “never create or adopt any architecture until you have a very clear idea of how you’d test, profile and monitor it”. If done properly, the system Dino describes would have failed under even the most cursory scalability testing, and the precise location of the fault could have been identified early on in development. By neglecting the proper ‘instrumentation’ of the layered approach, and a proper deployment procedure, I’d guess that some perfectly good components of the architecture had to be scrapped unnecessarily. I would dread to think of the cost to the business of suffering a malfunctioning site for such a long time. Normally in this situation you’d profile and analyze rather than throwing voodoo at it. Sounds like it could be a good submission for TDWTF with a little dramatisation. I am reading what you say and trying to bear it in mind Phil 😉 not sure I pass muster as a guru yet but you can only work on it. Why did they not scale? They had an architecture that could scale but they did not scale the application, did they? Of course, there were flaws int the architecture and async implementation, but that was only part of the problem. You wrote: "Furthermore, most page requests were hitting the HTTP façade which, even with the cache turned on, at some point became not so quick to respond." – The easyiest solution would have been to just add another computer instance to the layer. That’s what a scalable layered multi-tier architecture is all about. Your wrote: "These days, scalability is better achieved with a super-optimized and compact single tier web application that is then deployed to some cloud infrastructure." Not this nor an advice like "build everything with a scalable multi-tier architecture" would be a good advice. To me it seems the moral of the story is that our hero did not see or could not sell to the stakeholder that a layered multi-tier architecture costs compute resources and with it money. Your advise "These days, scalability is better achieved with a super-optimized and compact single tier web application" works and is probalby the cheapest solution if you go from 100 to 1000 users, but not from 100 to 100000 users. You will hit other bottlenecks which require messages, queues, caches etc. and with it a different architecture than a "compact single tier web application". The whole, "ABC database doesn’t support our mammoth transactions, so we’ll roll our own, much better one…" always reminds of the first attempt at massive, real-time, transaction processing. It’s still around, in witness protection as TPF. Cost a bunch of bucks, is written in near-assembler, and is blazingly fast. Runs only on big iron, of course. Somehow, I doubt the web-kiddies would ever grok it. "The world’s largest TPF-based systems are easily capable of processing tens of thousands of transactions per second. TPF is also designed for highly reliable, continuous (24×7) operation. It is not uncommon for TPF customers to have continuous online availability of a decade or more, even with system and software upgrades. This is due in part to the multi-mainframe operating capability and environment." I would still have gone for the same architecture mentioned above: a generic Web Api/Servicestack layer which shields the datalayer. It has so many advantages regarding the devices you can serve. I wonder if the same problems would arise if you would have chosen a HTML front-end perhaps using the Angular or JQuery. Maybe someone knows the answer? Lately I am dropping SQL Server in favour of document databases. And for my last project I have created a persistent In-memory cache using .NET’s powerfull collections/sets.I got this idea from Redis. I ran a site for about 1 year using Redis and due to speed I decided to write my own. Using Linq this was a very easy effort. Thank you for this article and I think there are no do’s and dont’s: it always depends on the situation. So a single layer application could be the best choice. Between clients and middleware there are many ways of smearing out sluggish processes over more hardware. When the queues grow too long, just hire more lazy clerks (while optimizing them without adding unnecessary pressure on the team). Performance problems on the front end and APIs are relatively negligible compared to when the database tier becomes the bottleneck. When deadlocks start piling up, how to scale? Especially when it’s hosted on a VPS somewhere. The only way out after beefing up the hardware, (SSD’s and terabytes of internal memory) is carefully fixing the long-running queries and transactions (please correct me if I’m wrong). So, in a sense the moral of your story may finally be true at the rock bottom persistence layer.